I run a small architecture and design studio, DesignAware. We are passionate about design, awareness, and we design everything, from wearables to furniture to architecture. Our foremost aim is to create awareness about design: to encourage a dialog between designers and users. We believe in open source accessibility of the design process, and all our processes are shared on our website, DesignAware.org. Our way of approaching design is two-fold. Through design research, we approach a design from many different ways and evolve it into many iterations and versions to suit different requirements and contexts. Through our design + build initiative, we address the issue of building. To build is to make something real, useable and workable. Using digital tools and 3D modeling software, we design in virtual space and fabricate the same design using real materials. The design process moves between the digital and physical realms. As an architect, it is extremely gratifying to see your ideas realized into something tangible. And as rewarding as it is to turn empty land into a meaningful built space, the backend of architecture is very demanding. It involves strenuous work, long hours, late nights, low pay, and high liability. This is why architects are generally portrayed as night owls who dress all in black and smell like coffee. Architecture is a slow process, and setting up an architecture firm is no different. For a long time, DesignAware did not have a physical address. We wanted a studio that was not bound by geographical location. Our team, which is scattered around the world, collaborated virtually. Our office was the cloud, and Skype was our conference room. Even today, I only have one physical studio in Hyderabad, with virtual studios in Dubai, London and Dallas. When I could finally no longer put off setting up a studio for DesignAware, I faced many challenges which, I’m sure, are not limited to start-ups alone. The foremost issues were of space and location, and also of funds. With real estate rates in prime locations going through the roof, as the director of a start-up in its nascent stages, I could not afford to lease a studio space large enough to accommodate all our experiments and still make a good impression on potential clients. I looked at plug-and- play offices, which provided a prestigious address, a corporate setup with a receptionist and fully-equipped conference rooms on lease. And the actual workspace? A cubicle with a plug-point to set up your laptop. Plug-and- play, indeed. This was disturbing for more than one reason. The space was cramped and did not allow us to even use our imagination, forget about conducting crazy experiments. These offices looked great to visitors, but lacked personality: they were all set up for work, but not at all for play. This cookie-cutter model did not reflect the true culture of our design start-up, and I could see that the space itself would become a hindrance to creativity. The detested 9-5 workday model I had escaped from would seep into DesignAware, by way of the office. More than any other space, it is a workspace that needs to be fun, to have a lighter side, to touch a chord within and inspire. You spend more than half of your day at your office, shouldn’t it be even more tailor-made to your needs than your home? Every start-up begins with a big idea, an urge to break barriers and invent, to stand out from the herd. Work like that needs a space that incubates creativity and challenges the very definition of work. That’s when the lines between work, worship and the workshop begin to blur. I decided to take the road less travelled, and renovate an old house that had been abandoned for over five years. The house was in a deplorable condition: the walls were cracked, the flooring was caved in, and water was seeping into the ceiling, which had fallen in at many places. The tenants were unwilling to move out, because they were a family of rats. If I had ever prayed for a design challenge, this was the answer to my prayers. I took on this adaptive reuse project to prove that design can improve the quality of any space, and that good design does not need to break the bank. Some called me crazy and others prepared to comfort me after my inevitable failure. After the renovation was completed, though, the space was unrecognizable. The studio became our first built project. In it, we questioned the generally-accepted norms of workspace design: Is it necessary for a business to have a physical space? Does location matter? Can an office be designed on a low budget and still avoid looking cheap? Do we always need to work at desks and chairs? Or can we sit on a beanbag with our laptops? Can an office have music and drums? Does interior space need to be segregated from exterior space? Can we bring the outdoors inside? Do we really need a roof? Can an office have a hammock or a tyre swing? Why not? The studio was completed in a very short time of two months and within a tight budget. Most of the furniture was refurbished or upcycled: an old ladder became a magazine rack, a fruit stand found new life as a postcard holder, and a drum was reborn as a side table. My desk was created from repurposed window grilles, which were going to be thrown away. Put off by the furniture available on the market, which was heavy and large, and cumbersome to relocate, we designed a series of furniture made of interlocking pieces, which can be put together easily and dismantled and flat-packed for storage or relocation. This furniture was prototypical, meaning that it could be taken apart and reassembled in different ways. This is furniture for the new nomad, who works online, moves frequently, gets bored with routine and detests permanence. Working in a studio space with such a history is interesting as it becomes a walk-in portfolio for our clients. A built space gives clients faith and an awareness of how a space designed by DesignAware looks, feels and functions. It proves to skeptics that no matter how run-down a space is, it can be given new life through design thinking. It also shows clients that we’re fun- loving people, for whom work and play happen simultaneously, overlapping and reflecting in our designs. I see DesignAware, not as a business, but as a movement to create awareness through liveable, wearable, usable, accessible and responsible design. Takbir Fatima is an architect who has lived, studied and worked in Saudi Arabia, India and the UK. Takbir has an MArch in Architecture and Urbanism from the Design Research Lab at the Architectural Association School of Architecture in London. 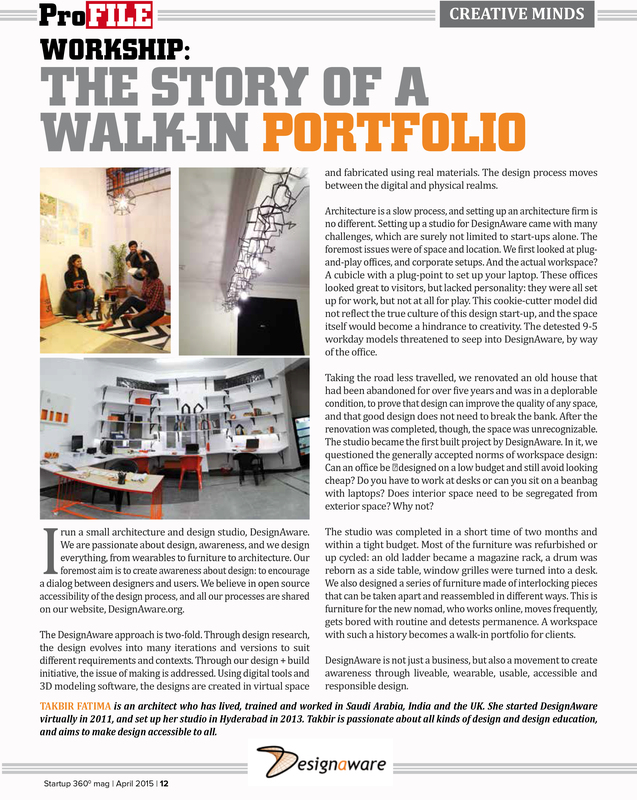 She started DesignAware virtually in 2011, and set up her studio in Hyderabad in 2013. Takbir is passionate about all kinds of design and design education. She aims to make design accessible to all, instead of remaining the forte of a selected few.